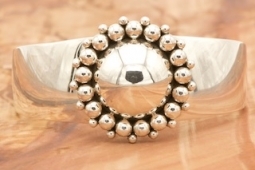 Heavy Gauge Sterling Silver Bracelet Created by Navajo Artist Artie Yellowhorse. Signed by the artist. The Yellowhorse trademark "Rising Sun" design is one of their most popular collections with its round or oval-domed center surrounded by small 'drops' or beads of silver - each one made by hand. The Rising Sun is 1 1/2" x 1 1/2".